As April comes to a close, the Atlanta Botanical Garden's first annual Atlanta Blooms! exhibition does as well. But, blooms are in full force throughout the Garden...as are frogs! I've seen so many frogs in the Garden lately that I feel I'm developing a fondness for the creatures...the Garden's amphibian research is a likely contributor to that fascination, as is the sighting of frogs in several gardens within the Garden. 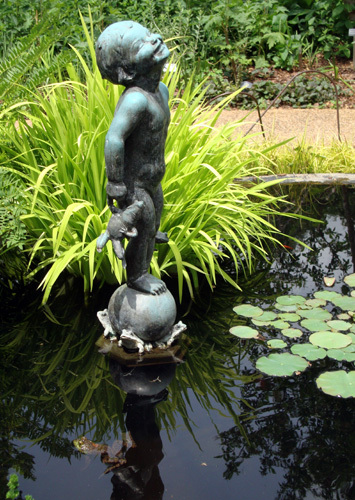 And did you know that there's a daily frog feeding at the Garden? It takes place in front of the Fuqua Conservatory every day at 11:00 a.m. It's a great event for seeing some of the Garden's frogs, in part because feeding time is their most active time of day. So, in addition to the human-size frogs throughout the Garden, there are lots of real ones to be sighted as well.